Founded by Puritans in 1630, Boston is one of the oldest cities in the nation and likes to boast about its role in historic accomplishments, good and bad. Its citizens sparked the American Revolution and played a role in both the Salem Witch Trials and abolition movement. In more recent history it’s proved to be a breeding ground for music acts of all types, from The Pixies, Mighty Mighty Bosstones and Amanda Palmer to the Wahlbergs, now more famous locally for their burger chain than their days making music. Its history is imbued across the city, from European style architecture and narrow streets in The North End and Beacon Hill to lush gardens and old-world style pubs. Given its colonial roots, the city is better suited for walking than driving. At just 48 square miles, it’s an easy stroll from one end of the city to the other. 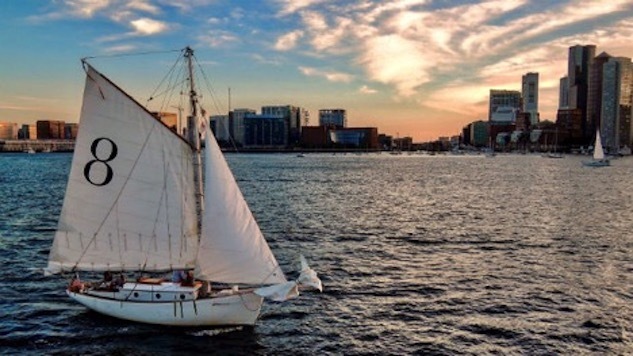 Searching for the quaint Boston touted in guidebooks? Find it on Beacon Hill (pictured above). The 18th century neighborhood is a patch of cobblestone alleys, gas streetlamps and stately brownstones. For breakfast cozy up at a table at Tatte Bakery & Café. Savor freshly baked pastries or heartier fare like their acclaimed shakshuka, but do it early before the brunchers and students start piling in. From there make the short walk up Charles Street to the Boston Common, the public green space full of dog walkers, loungers and runners. On summer evenings catch free performances from Shakespeare on the Common, while winter brings an open-air ice skating rink. Across the street is the Public Garden (pictured above), the country’s oldest public botanical garden. In spring the park is carpeted with tulips and the swans return to the lagoon each summer. Office workers and pigeons gather in Copley Square during lunch break on the steps of the Boston Public Library (pictured above). It’s arguably the most opulent structure in the city. The library’s original McKim building houses rare murals; a grand marble staircase; and Bates Hall, the barrel-vaulted reading room with rows of oak tables. Around the corner, Newbury Street offers plenty of shopping and a chance to enjoy Boston’s cafe culture and prime people watching. The mile long stretch mixes quirky boutiques and high-end brands, and bustles with hipsters, students and ladies who lunch. Take a coffee break at Trident Bookseller Cafe, one of the last independent booksellers in the city with an in-store cafe serving a full menu and weekend brunch. Alternately grab an Italian gelato at Amorino. Lunch in the Back Bay can be quite a crowded experience, especially in spring and early summer when Bostonians emerge from their winter cocoons. The Parish Café is a perennial favorite offering over-the-top sandwiches, such as a meatloaf club served alongside mashed potatoes and a Mexican-style eggplant parm torta, in a boisterous space. There’s a long beer list, including many local craft brews. In summer grab a patio table overlooking the Public Garden. Art lovers should leave a few hours to visit the Isabella Stewart Gardner Museum. While the city boasts a handful of world-class museums, the Gardner, founded by a quirky woman who traveled the world in search of pieces she fancied, is the most imaginative. The artwork is housed in a Venetian-style palazzo, and the manicured courtyard alone is worth the price of admission. Not long ago the Fenway neighborhood, home to the nation’s oldest professional ballpark, was void of much else except pregame dive bars and student housing. Today it’s more likely you’ll spot gorilla art installations instead of crushed beer cans on the sidewalk, and it boasts a number of popular yet unfussy restaurants. Make a reservation at Eastern Standard for a lively dinner in a Parisian-styled bistro. It’s also home to award winning cocktails, including the best Sazerac outside of New Orleans. For spicier fare, opt for Tiger Mama from Top Chef contestant Tiffani Faison. The Southeast Asian inspired menu shines with dishes that exude a perfect blend of sweet, spicy and salty. The lush interior full of plants and exotic décor will almost make you forget you’re in New England. For live music take the subway’s Red line to Cambridge. The Middle East in Central Square is a no-frills institution, while The Sinclair in Harvard Square is the newest addition to the music scene with balcony seating. They both serve up a steady supply of established and up-and-coming artists from indie bands to neo-folk and electronica outfits. Sip creative cocktails or draft brews before the show at Brick & Mortar. There’s no sign on the door, and the interior is dimly lit—just the way the aloof crowd likes it. If you need a late night snack, you’ll need some help. Boston suffers from a dearth of late night dining options. Clover in Central Square is one of the few 24 hour joints. Nosh on fresh vegetarian fare like falafel, fresh cut fries and pour-over coffee in cozy confines with communal seating and free Wi-Fi. If you prefer vintage diners with breakfast all night, opt for South Street Diner near South Station. You’ll sit on vinyl stools side-by-side with rock bands, construction crews and lawyers working late nights. While not 24 hours, Saus serves up the city’s best Belgian-style fries with homemade dipping sauces, as well as decadent sandwiches until 2 a.m. on weekends in a postage stamp-sized space.